Power Metal is one of those genres for me that is a hit or a miss. Some albums and bands are great and some are very ordinary. 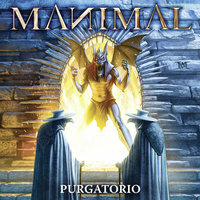 So here we have Swedish Power Metal band MANIMAL with their 3rd full length album “Purgatorio” releasing this September on AFM Records. The album starts with an impressive track in “Black Plague” starts off with a really cool sharp guitar work before Samuel "Sam" Nyman’s loud clean Power Metal vocals hit you like a melting steel. There is melody, there is rhythm, there is beauty, and there is theatrics. It’s Power Metal as we all know it. Both the vocals and the guitar solos are reminiscent of old school PREIST. The album title track “Purgatorio” has lots of UDO / ACCEPT influences all over it. The song writing is commendable here and is very catchy too. The stylishly self-titled “Manimalized” squeezes in all that the band has to offer in one song, with some really cool guitar solos and backing gang vocals. “Spreading the Dread” is one hell of headbanging song, but a tad bit slow to my liking. “Traitor” takes you to a parallel universe with its larger than life music. The eerie lyrics perfectly complement the eerie sound in “Behind Enemy Lines”. One of the best songs of the album in my opinion. “Denial” continues the sad depressing apocalyptic lyrics from the previous songs. The album ends with 2 really melodic but depressing songs in “Edge of Darkness” and “The Fear Within”, the former being much heavier and faster compared to the latter. I’m not the one to give easy praises to albums, but “Purgatorio” does bring out lot of emotions out of the listener and is a great Power Metal album, even for fans who are not the seasoned fans of the genre. The album doesn’t bring a whole lot new to the table, but it does best at what it promises.